A legally binding document states the terms and conditions regarding the sales of items or goods. Through this agreement, both the buyer and seller are legally connected in any buying or selling of the specified good. 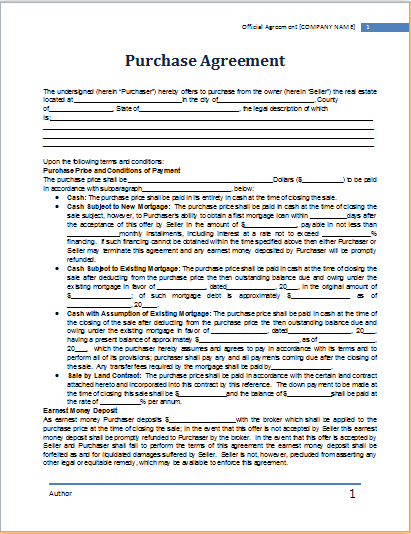 There are two types of purchase agreement the absolute purchase agreement is a simple type of agreement just as your invoice receipt and the purpose of such agreement is to keep the record of the dealing and it can be used if the return of the purchase is inevitable. The second type is the conditional purchase agreement which encompasses the security of loans and deposits regarding the purchases. This agreement is used when a seller is authorized to take back its asset if the buyer is not able to fulfill the loan submission on time like in real estate mortgage foreclosure. Purchase agreements are more complex than a simple purchase receipt as this agreement usually strictly defined the terms and conditions that have to be fulfilled by both buyer and purchaser for a complete deal. Download your win purchase agreements from free templates available online to design a comprehensive and well-presented purchase agreement.